Por fin! La boda va a tener lugar en el próximo capítulo y todo ya está preparado, incluso el plan de Rubí de quitarle a Maribel de su prometido. Nadie más que Loreto sabe lo que pasa en verdad y a eso obedece mi entusiasmo. No, no soy mala gente. Lo que pasa es que, sé que va a pasar un gran escándalo que va a cambiar la vida de los personajes en esta telenovela. Lo que quiero decir es que me afectan los que suceden y eso significa nada más que es una buena telenovela, no? Bueno, me quedo así de afectado. Así que es por eso que esta telenovela es mi favorita! A propósito, da gracia la actitud de Doña Lola. Es verdad que alguien se va a quedar así si le robaran pero aunque su actitud es tan seria, aún se ve tan cómica la vieja. At last Rubí meets up with Hector, first accompanied by Lorena and Paco and later, alone. She goes to work, sweet-talking him, kissing him non-stop. There is no other choice but for him to fall. Excited, Rubí returns to Mexico and goes directly to Maribel’s house. At this point she appears to be pretty much ready to harm her friend. She is beginning to show her true colors. The people surrounding her are also learning the truth bit by bit. Doña Elisa hears from Alejandro’s father that Rubí is ambitious. Maribel finds out the truth from her friend herself, that she loves money. And so the farce is about to end. Hector also returns to Mexico to tell Maribel that he no longer wants to get married to her, but he is not able to so because of fear and shame, perhaps. At last! 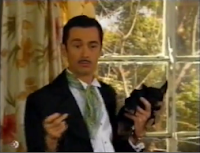 The wedding happens in the next episode and everything is ready, including Rubí’s plan to steal Maribel’s fiancé. No one else aside from Loreto knows what is really happening and my excitement stems from that. No, I am not a bad person. It is just that I know that a big scandal is about to happen and that it would change the lives of the characters in this soap opera. What I mean is that I am affected by what is happening, and that only means that it is a good soap opera, right? Well, I am that affected. And it is because of that that this soap opera is my favorite! By the way, Doña Lola’s behavior is funny. It is true that someone who gets robbed would behave that way but even when she is serious, she still appears to be funny.